Tāngyuán is one of my favorite desserts. 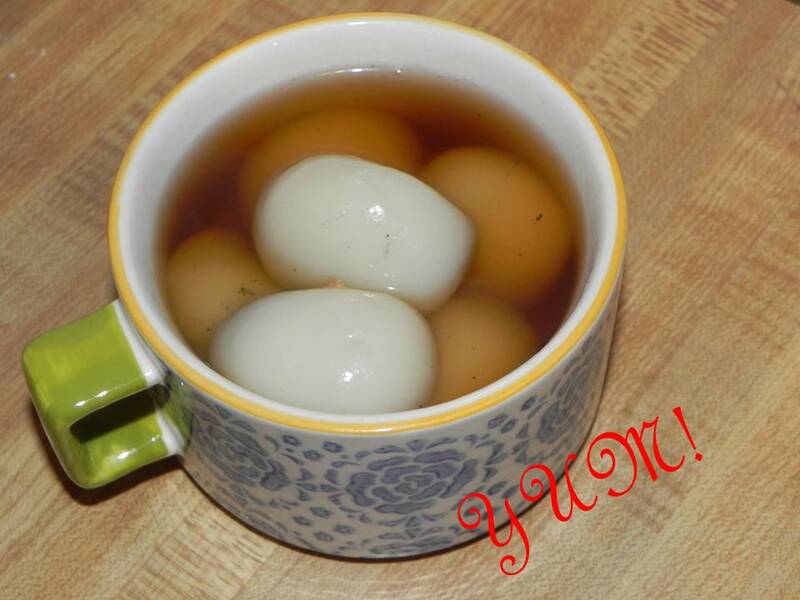 It is a simple yet delicious dessert traditionally eaten on Lantern Festival day, the 15th day of the Lunar New Year (February 17th of this year). Given that we have places to go this year, my family thought it would be a good idea to make them early, so we made and ate Tāngyuán, this weekend. 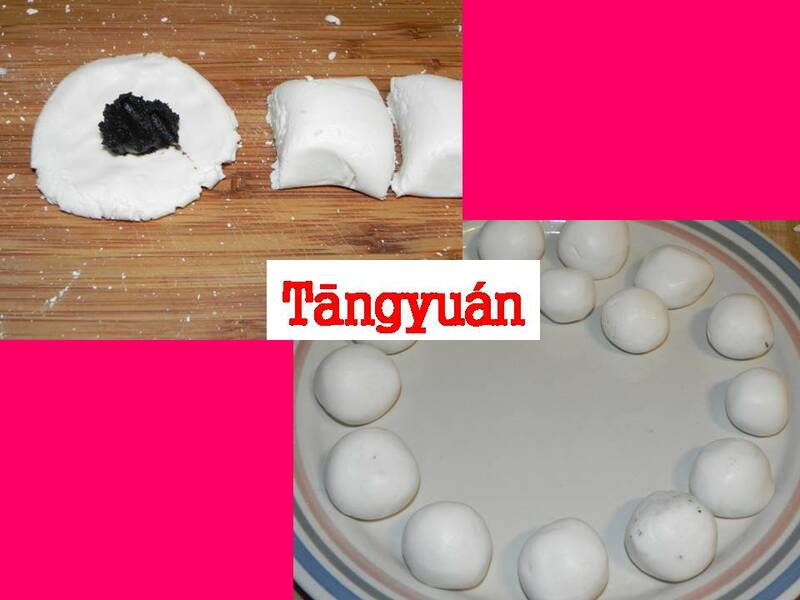 Most of the time, I just eat the Tāngyuán that one of my relatives made or get them from a shop/restaurant, but this is a special year for me because this is my year and I volunteered to make this by hand because I remember making this when I was younger and having a blast rolling them in my hands. (Yes, I am a hare. Are you really that surprise? Lol.) Anyway, I asked one of my parents for the recipe because I forgot and found out that it was super easy to make. You can buy the ingredients at almost any Asian markets and the rest you can find in your own cupboard. And by the way, rice flour is a gluten-free food, so this is okay to eat if you are following a gluten-free diet. 1/2 of a ginger root, cut up and smashed (to release the aroma and flavor) If you are worried about it being not pretty, you can put into a bit of cheese cloth and tie it up and then scoop out later from the soup. Clean and simple. 3.) Knead. Make sure that the dough is not too hard nor too sticky. 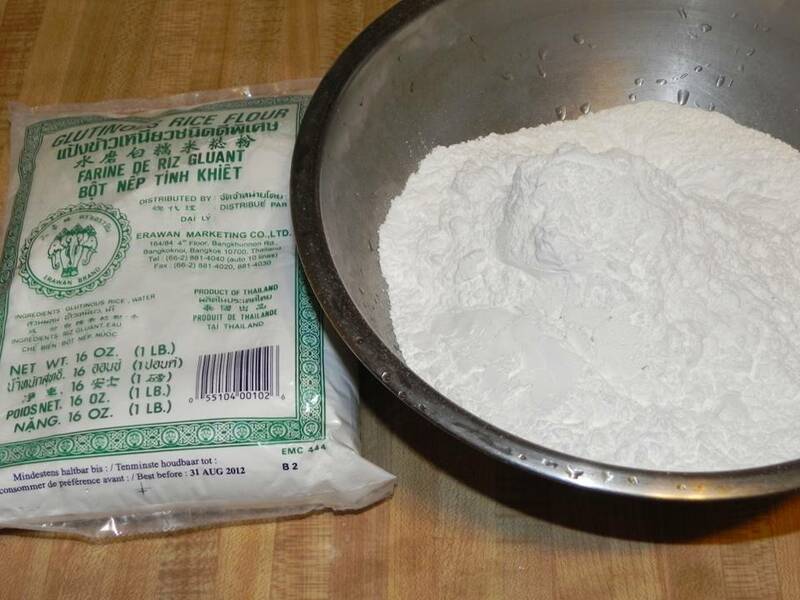 If the dough is too hard, it needs a bit more water, but don’t put too much in because if it has too much water, then you will need to put more glutinous flour in to firm it up. Basically, you will know the dough is ready when it’s becomes a soft to the touch, but without being too sticky. 4.) Get a fistful of dough and roll it on your hand and cut out little pieces about 1.5 to 2 inches. Don’t worry if this is a bit bigger, you don’t have to be too precise, but the bigger the dough ball the better if you are just starting out because the filling can get tricky. 8.) Fill another pot with water (about 4-5 cups) and let it boil. (Pot #2) When it boils, Put in the 1/2 cup of brown sugar, all the ginger, and the optional Longan. 9.) 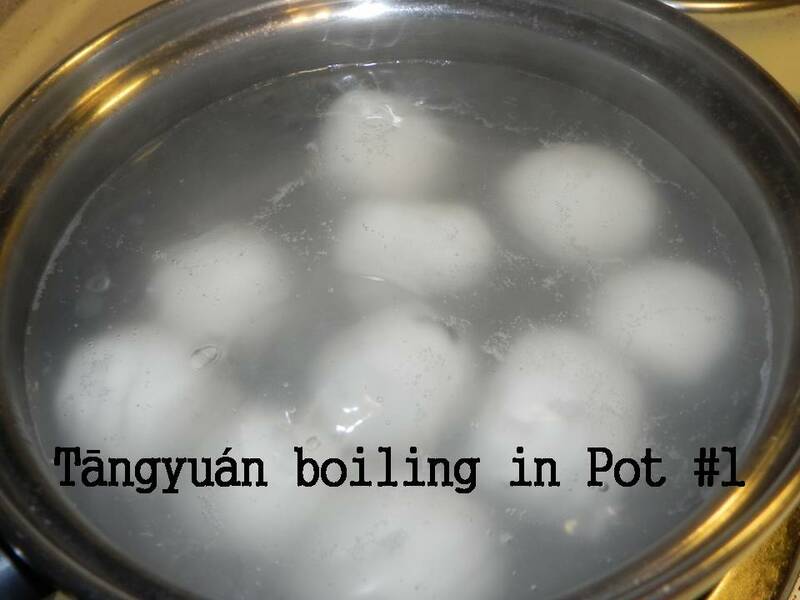 When the water is boiling in Pot #1, carefully drop each Tāngyuán in the pot, carefully stir once to make sure it’s not sticking. You may have to do this in batches if you have a lot of Tāngyuán. But don’t worry, they are really quick to cook. 10) Once you see the Tāngyuán float up in Pot #1**, it’s done. 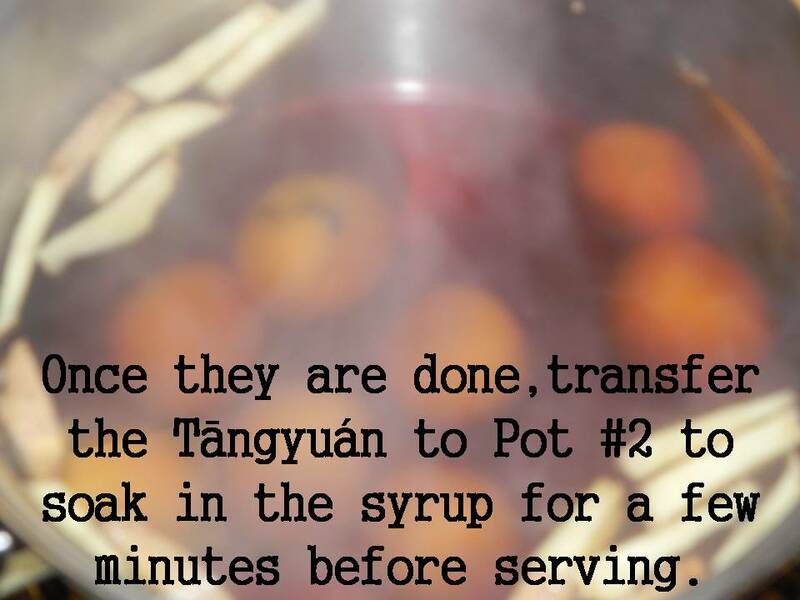 You can then transfer the Tāngyuán into Pot #2 and let it soak in the syrup for about 2-3 minutes. Then it’s time to serve it up in your favorite cup/bowl. **You can discard the water in Pot #1. *Fillings: You can have whatever sweet fillings you like in these, but traditionally, it’s usually lotus paste, black sesame paste, red bean (azuki) paste. I prefer black sesame or red bean (azuki) paste. WOW!!! What a delight!!! Happy New Year! Wow, this really sounds delicious. I’ve never made anything like this yet I am definitely intrigued. Great post as usual foodtable.